When I serve this dish, people can’t believe that something so simple could be so delicious. The key is to use kabocha, not regular pumpkin. I have tried to find anything to compare to kabocha’s sweet, almost chestnut like flavor and dense, rich texture, and I have not. 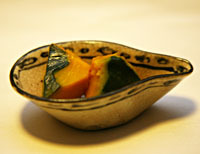 Cut the kabocha into half. Scoop out the seeds (which can be roasted like pumpkin seeds) and slice into wedges about 1 inch wide at their widest. If the pumpkin is large, cut the wedges in half. The skin can be eaten if it is smooth; if not, peel, but leave some of the green skin for contrast. Combine the simmering ingredients and boil the pumpkin pieces, covered, for 5 minutes. Reduce the heat to a simmer for about 20 minutes, or until the pumpkin can be easily pierced with a fork, but is still firm. Take care not to simmer too long, or the pieces will become too soft and will fall apart. Transfer carefully to a plate, (this is a little tricky) and pour the pot juices over the hot pumpkin. This will allow the pumpkin to soak up the flavor as it cools. Serve communally, in a large bowl, or in small individual bowls. An attractive arrangement is two prices facing up, topped with one piece facing down. Refrigerate leftovers in the remaining pot liquid. It will keep for several days.